You know you want to do some dorm room decorating for the holidays. However, deciding on how to decorate your college dorm room for the holidays can be some pretty tough work. You have to decide on your dorm Christmas tree and all of the holiday dorm room decorations to be placed on it along with some cute dorm wall art pieces to complete the overall effect. It can be quite overwhelming to decide on the perfect dorm room decorations for your holiday dorm room decor theme. The dorm item you want to start with is your dorm Christmas tree. However, with so many colors and styles, you may feel overwhelmed with just that dorm item! Maybe you want tradition with some unique flair. For a traditional yet unique dorm Christmas tree, add our Mocha Whimsical Laser Dorm Christmas Tree. 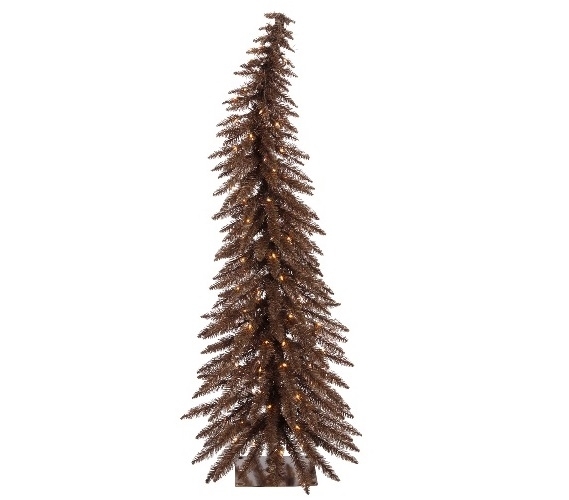 Our Mocha Whimsical Laser Dorm Christmas Tree features a rich chocolate color on the branches and trunk. It creates a one of a kind style for your college dorm room decor, yet it isn't going to overpower your college dorm room with bright color. This dorm essentials item will allow you to create a complete dorm room decor theme for the holidays by letting the dorm room decorations you place on the branches stand out. Whether you choose to stay in classic color themes or add bright garland and ornaments to the branches, the rich chocolate color of this dorm necessities item will make your holiday decorations pop with color. Our Mocha Whimsical Laser Dorm Christmas Tree even comes with Clear mini dorm lights on the branches so you have one of your holiday dorm room decorations already taken care of, both in your college dorm checklist and on your dorm Christmas tree!